You’re going to hear a lot from me this month. 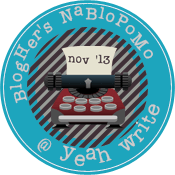 I signed up, with a little prompting from my friend Lois Alter Mark over at Midlife at the Oasis, to participate in NaBloPoMo (National Blog Post Month). Essentially, this means that I have agreed to write a blog post every day in the month of November. I’ve been getting a little lazy, become a bit of a procrastinator where my blog posts are concerned, so, I figured, what the heck, I’m going to give it a whirl! I signed up through BlogHer and yeahwrite… and promised to provide a “backlink” (Linking to the HOST) — so, I hope this is what they mean by that, LOL! I hope I can do this thing, I hope you all stick with me! This entry was posted in writing and tagged BlogHer, Midlife at the Oasis, NaBloPoMo, yeahwrite. Good luck–wish I had the cajones to give it a shot! I shall live vicariously through you and try to read all of your posts. If you run out of material I’ve got a few cavalier rodent antics that you can have. Just let me know and I’ll give you the story. I don’t have the gift you have but I’d be more than happy to share. I think you should make a a story of the compilation of all the things that happened to you in a supermarket including the transference of the cricket. Wow! A daily post? Very brave of you! Well, I don’t know that it’s so much “brave” as it is “insane”, LOL! So excited to do this with you! And I can’t believe you already have your first post done! No, I don’t. It doesn’t count. Silly me. I posted it before midnight EST last night, LOL. I’m so scared of the commitment. ..
Don’t be afraid. Who cares if you don’t finish? Just give it a whirl. Do the best you can! Eek. I have 40 minutes to decide!!! I am honestly going to try to actually write something every day —- I generally don’t do “wordless Wednesday” or any of that stuff, so I feel like it wouldn’t be in the spirit of the project to post just pics, etc Of course, check back with me in a week and I may well be singing a different tune, LOL!